In a year where Kentucky and Florida ceded their dominance at the top of the Southeastern Conference standings, the Bulldogs squandered an opportunity for a breakthrough. It could mark the end of Fox’s nine-year tenure , which has featured only two NCAA Tournament appearances (both of which were one-and-done). While hardly a traditional powerhouse, Georgia certainly expected better from a team that featured Associated Press SEC player of the year Yante Maten. The Bulldogs are just 16-14 (7-11 SEC) heading into Wednesday’s first-round matchup against Vanderbilt in the conference tournament. Ten years ago, in an SEC tournament remembered for a tornado striking the Georgia Dome, the Bulldogs pulled off a stunning SEC triumph after finishing last during the regular season. That performance saved Dennis Felton’s job for the moment, but he didn’t even make it through another full season. Fox appears to be in a similar situation, requiring five wins in five days to even get a shot at Year 10. While it would be unusual to fire a coach after such a short tenure, these are dark times in Pittsburgh. 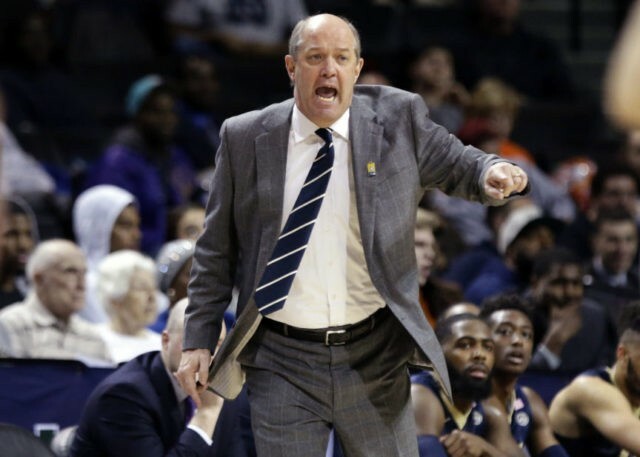 Stallings’ team lost all 19 games against ACC opponents this season and is just 24-41 overall since he arrived from Vanderbilt. Also working against Stallings: He wasn’t a popular choice from the outset, and the current athletic director, Heather Lyke, isn’t the one who hired him. Ollie has the 2014 national championship on his resume, as well as an American Athletic Conference title from just two seasons ago. But the Huskies have taken a significant fall since then. After slipping to 16-17 last season, UConn is just 14-17 — and 7-11 in the league — heading into its AAC tournament opener against SMU on Thursday. Athletic director David Benedict plans to evaluate Ollie after the season , and it’s clear the boss isn’t happy with the state of the program, which is also facing an NCAA investigation. On the other hand, Ollie’s lucrative contract would require a buyout of some $10 million. Fran McCaffery brushed off questions about his job security , despite an unexpectedly dismal season that ended last week with an overtime loss to Michigan in the earlier-than-usual Big Ten Tournament. While the overall body of work and a contract extension may give McCaffery some extra security, there’s no doubt the Hawkeyes faithful is on edge after a 14-19 campaign that included just five wins in 20 games against conference opponents. More troubling, Iowa wasn’t even competitive at times, losing eight Big Ten games by double-digit margins and finishing last in the league in scoring defense. The Hawkeyes could be headed for another long season if sophomore star Tyler Cook decides to leave. One of college basketball’s most prestigious jobs could be opening up unless the Cardinals decide to remove the interim from David Padgett’s title. Even then, there are other issues to consider. All the uncertainty swirling around the NCAA coaching ranks because of an ongoing FBI probe could actually work in Padgett’s favor, since some of the top potential candidates have been linked to the scandal. But being a former Pitino assistant could be a major strike against Padgett, especially if Louisville’s new administration wants a totally clean reboot to the post-Pitino era. The Cardinals’ NCAA hopes took a blow last week when they lost to No. 1 Virginia on a buzzer-beating shot , so they’ve got some work to do in the ACC Tournament. Louisville (19-12, 9-9) faces Florida State (20-10, 9-9) in the first of four games Wednesday, a contest that will likely determine which school remains in the NCAA mix for at least one more day.